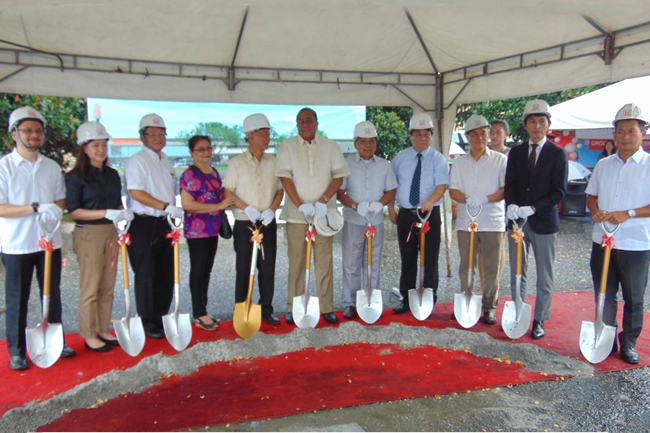 Honda Cars Philippines, Inc. (HCPI) breaks ground for its second dealership in Pampanga, Honda Cars Angeles-Clark (HCAC) last July 22, 2015. Honda Cars Angeles-Clark, with a total lot size of 2,500 square meters, will be located at Manuel A. Roxas Highway, Angeles – Clark, Pampanga. The new dealership will be inside the Clark Freeport Zone, across SM Clark. The fully operational dealership will offer Honda’s latest line-up as well as services such as general repair and preventive maintenance. This dealership is owned by Engr. Eriberto Gomez, and is his second Honda dealership. The groundbreaking ceremony was attended by the following: Toshio Kuwahara, HCPI President and General Manager, Masanao Kataoka, HCPI Assistant Vice-President for Sales, Marco Medina, HCPI General Manager for Sales, Norman Millare, HCPI Assistant Vice-President for Customer Service, Satoshi Nishimiya, HCPI Assistant Vice-President for Customer Service, Engr. Eriberto Gomez, HCPG President, Erik Gomez, Honda Cars Pampanga (HCPG) General Manager, Eloisa Gomez, HCAC Chief Financial Officer, Wihelmina Gomez, HCAC Director, Atty. Arthur P. Tugade, Clark Development Corporation President and CEO, and Manual M. Feliciano, Clark Development Corporation Board of Director. HCAC is set for inauguration on the first quarter of next year.